Below is a reasonable article about Martin Armstrong that came out today in MoneyWeek online. I’m placing the entire article here so that it can be archived along with Martin’s articles as it’s a good introduction to his work and situation for those who are not familiar. Glad to see him getting more press, please let me know if you see him anywhere else. To view the entire article at MoneyWeek, please click on the headline link. 27 February 2007 is not a date that stands out. It is not indelibly imprinted on the minds of millions; it does not carry the pain or notoriety of 9-11; unlike 'Black Wednesday', it has not been nicknamed Nor, like 31 August 1997, The Day Diana Died, did it send a nation into mourning. Yet the repercussions of this day are, quite simply, enormous. They may be felt for decades, and possibly mark the beginning of the next Great Depression. For this was the day the greatest credit bubble in history peaked and popped. And one man predicted this turn as far back as the 1970s. He is Martin Armstrong. Martin Armstrong's story reads like a thriller. He was a globe-trotting and extremely contrarian investment manager, who in the late 1990s was accused of misappropriating Japanese investors of some $700 million in some kind of Ponzi scheme. It appears that, like Nick Leeson, the money was lost on bad bets in the currency markets and losses were being concealed, though Armstrong said he did not authorise the trades. 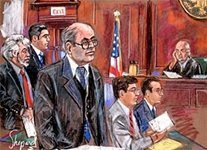 Nevertheless, he was indicted in 1999 and ordered by Judge Richard Owen to turn over gold bars and antiquities, which he is said to have bought with his firm's money, as well as computers and documents. Armstrong delivered four of the five computers sought, eight of the 11 requested boxes of documents and gold coins worth $1.1 million. The receiver said assets worth about $15 million were missing; Armstrong insisted that was all he had. Judge Owen – revisiting the order every 18 months - held him on contempt of court for some seven years, some kind of record for time in prison without trial. Nevertheless, Owen repeatedly held that Mr. Armstrong was motivated by greed and was awaiting his release from jail to retrieve the $15 million that the government said was missing. Mr. Armstrong's years in jail for civil contempt match the sentence of six-and-a-half to eight years that he would have received if he had been convicted of all 24 criminal counts of securities fraud, commodities fraud and wire fraud. But in late 2006, after appeal, Judge Owen was removed from the case. In 2007, after a period in solitary, Armstrong faced trial, pleaded guilty and is now serving a prison sentence for a further five years. What makes Armstrong's story exceptional is his astonishing economic confidence model, which he developed in the 1970s and 80s. 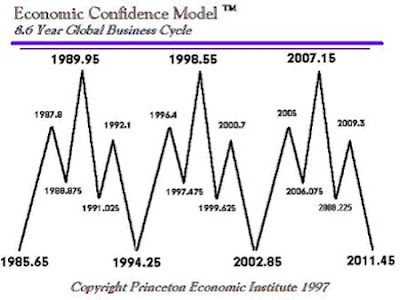 Looking back at centuries of economic data, Armstrong identified a long-term business cycle of 309.6 years, which is broken down into six waves of 51.6 years – roughly the same duration as Russian economist Nikolai Kondratiev 's more famous cycle. 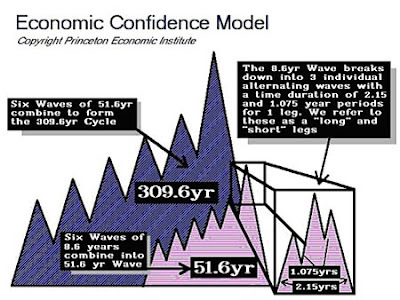 Armstrong's 51.6 year wave breaks down into a further six waves of 8.6 years, which break down into a further three individual waves of different duration. What many will find interesting is that the total number of days in one 8.6 year cycle is 3141 – or Pi times 1000. Hence the model is also known as the 'Pi Cycle'. The next chart shows the key wave dates of the recent past and near future. Let's look at some of these turn dates and see what happened. 2007.15 equates to 27 February 2007 (That is .15 of the year). The chart below shows the Dow Jones US Financials – an index of the major stocks relating to banking, insurance, real estate and financial services. You can see he's nailed the turn to the day. 1987.8 equates to 19 October 1987. The next chart shows the Dow during the stock market crash of 1987. 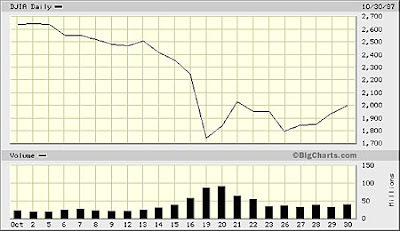 You can see Armstrong again nailed the low to the day. 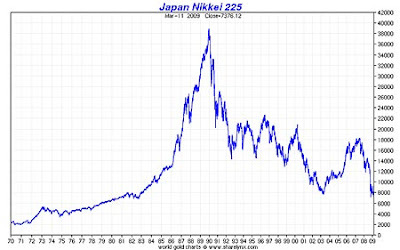 Not precisely to the day, but to within a fortnight, 1989.95 (December 89) saw the highs in the Nikkei, 2007. 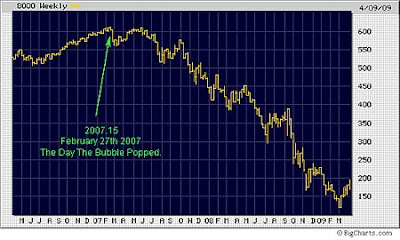 2000.7 (September 2000) saw the turn down in the S&P (September 2000), while 2002.85 (Octover-November 2002) saw the post crash lows. 1998.55 coincided with Russian debt default and the longtTerm capital management crisis, 1994.25 saw an intermediate S&P low. More recently we had 2008.225 (23 March 2008). 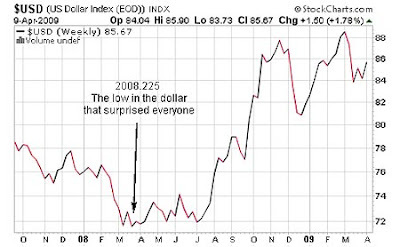 That caught the turn in the dollar that surprised just about everyone – myself included – especially those who thought the dollar's collapse was imminent. Some will say that it's easy to look back at history, attach an arbitrary pattern after the event, then call it a 'cycle', but you cannot deny that Armstrong's calls have been astonishing. In fact, his forecasting abilities and imprisonment have made him a cult figure among conspiracy theorists. He claimed to have developed a 32,000-variable super-computer based on his economic model, with "perhaps the largest economic database in the world". In fact, some claim the CIA and Chinese wanted this very computer model and the reason he was held in prison for so long without trial was that he refused to hand it over. Armstrong himself commented, "I know too much". 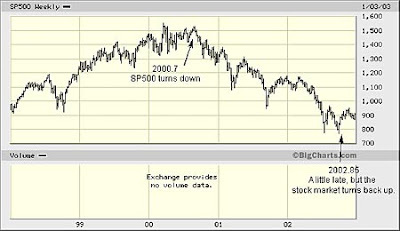 Nevertheless, of note to all investors, is that there is another Armstrong turn date coming on 2009.3, or 19-20 April. What we have to figure out is which market is going to turn. Armstrong once advised Canadian technical analyst Ross Clark that markets which were trending the strongest going into a cyclic turn point would be the most likely to reverse. "It is the concentration of capital that creates booms and the subsequent busts." So we have to ask ourselves which market fits this bill. Could this bounce in the stock or commodity markets run out of steam? It's possible. This year might be yet another when you should sell in May and go away. If we get a big rally into the weekend, perhaps we should look to sell. But I must say, I think this rally may have further to go. Could gold turn back up? Again, I see a low for gold coming in the summer – although $840-$850, if it gets there, is an obvious place to make a low. Could it signal the long-awaited end of the US bond market? Perhaps we'll see some turn in the currency markets. The yen could turn back up… or the pound could turn back down. As I write this, I can't see a market that's showing any signs of exhaustion. My bet is that we'll either see another major bankruptcy – perhaps a corporation such as GM, or even a country (Ireland?) – or we'll see some kind of turn in the currency markets. I should stress this is only a secondary turn date. There are plenty of examples in the past where nothing of any significance has happened at these junctures. In other words, they do not always work. But the outcome of this weekend, 19-20 April, bears watching with interest. Again, if you have questions you would like Mr. Armstrong to answer, I am gathering questions and will send them to him via an intermediary sometime in the next couple of days. 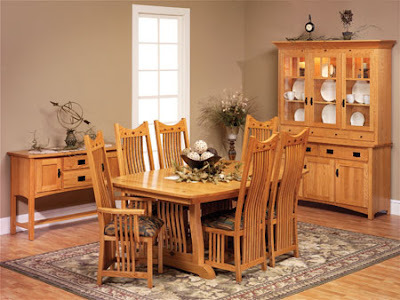 Please leave your question in the comments section.